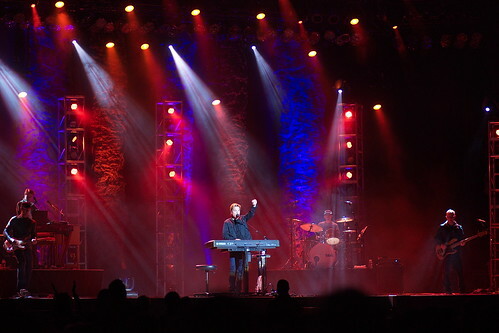 Michael W. Smith, a photo by The Bacher Family on Flickr. Every year, we try to get to a musical performance at the Puyallup Fair. 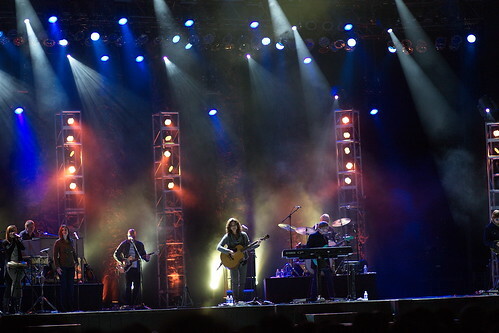 This year, for the second year in a row, we saw Michael W. Smith, this time in concert with Amy Grant. They played quite a few songs together as well as individual sets -- 3 hours of music with a 15 minute intermission. A lot of great music! Taking pictures at a concert is a special challenge. The light is so low -- yet on stage, with the lights on the performer's face, there's a huge amount of contrast between the light on the skin and the dark background. I compensated for the former problem by using my 85mm prime lens, with a very wide aperture to soak up every photon of light; and the latter by spot metering on the performer and hoping for the best. I got a lot of pictures that were so-so and a few that are really nice!